When her uncle dies, Lady Violet Thornhill makes to point to still excavate the site that they planned to visit together. Being a woman in this field gives her little opportunity to shine, so she is not going to let this opportunity to pass her by. When the owner of the site is not in residence, she must deal with Coll Munro, the estate manager. She never counted on being so effected by the man. Coll is still trying to get use to the idea of his new position when Violet comes into his life and disrupts it even further. Knowing that her station is far above his, he tries to deny the attraction he feels for her and keeps his distance. But when someone breaks into the house, Coll moves in to try and catch the culprit. This, of course, puts Coll and Violet in each others company a lot more. Can this unlikely duo make it work when they have so much going against them? This is book 3 in the series and they are all very much intertwined. I would recommend reading all three of them in order and one right after the other. I really liked Coll. He was definitely what I would consider to be a brawny highlander!! We met him in the first book of the series and he made several appearances in book 2 as well. You see the bitterness in him in the other books and then learn more about why he is the way he is in this one. Of course, it talks a good woman to make him have a change of heart. Violet was just an ok heroine to me. Nothing that really stood out to me other than that she was determined to live her life the way she wanted which was not common for that time period. The biggest reason that I would read this series in order and one after the other is that there is a mystery of a lost cash of gold that run throughout the books. Without reading all three books you don't get the full picture of it. 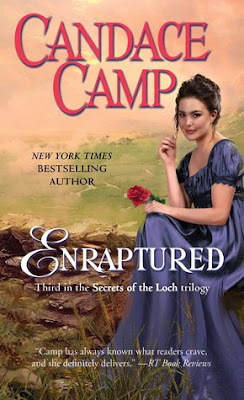 Camp has always been one of my favorite authors and I can't wait to see what she comes up with next!